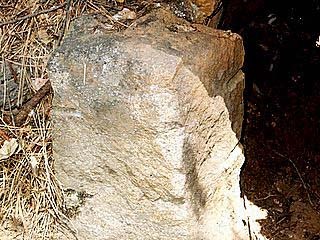 The stone structure described in a previous post was revisted this morning, the goal to discover how the structure was used. I am attaching five photos, that were taken today. 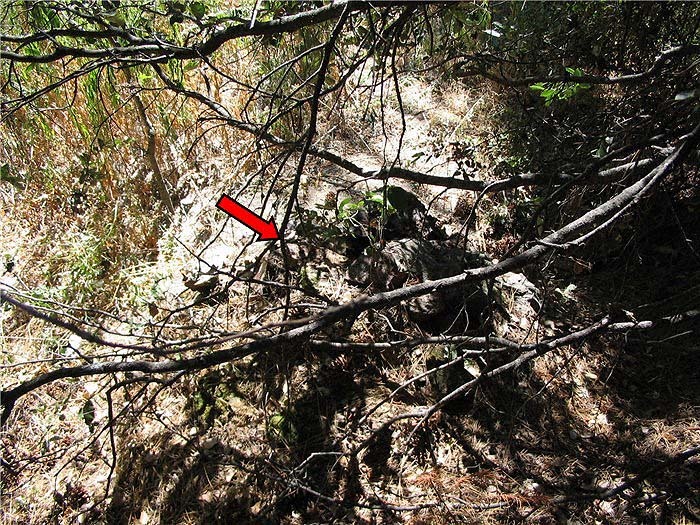 The structure is in the very bottom of a ravine, directly under what appears to be an old wagon road. The old CPRR grade is above this old road. The ravine, at the bottom, is perhaps 100 feet wide. The stream bed itself is today dry, and is on the opposite side of the ravine from the structure. 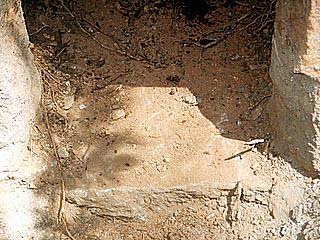 The soil that the structure sits on is heavy, pebbly sand. There are no trees in the bottom of the ravine. The structure is all stone, with no cement or other materials holding it together. 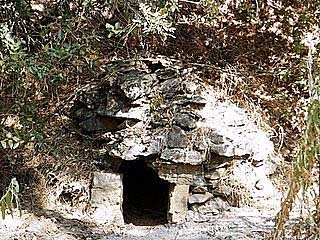 The entrance was opened to the bottom of the front wall, and a stone threshold was discovered. 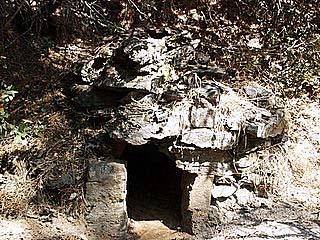 The bottom of the structure is flat, carefully placed stones of various sizes. The floor that I could see is nearly level. 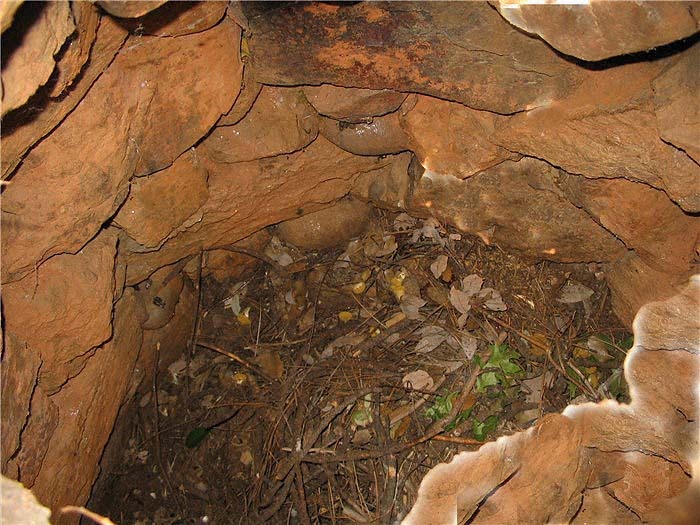 An animal of some dexterity has been inhabiting this structure; the floor is covered to a depth of 6 inches or more with leaves, pinecones, sticks, twigs, and other forest debris. 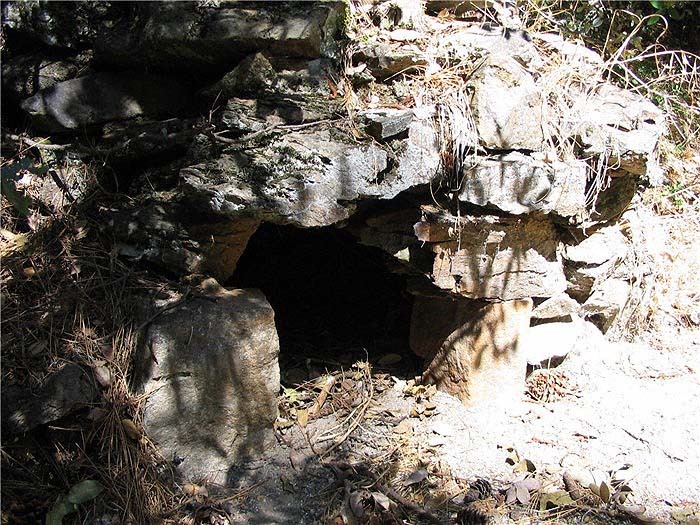 The stone walls at the bottom of the structure are two stones or more thick, the thickness, I am guessing is 12 inches or more. The walls get thinner as they go up, the stones at the top of the structure are just thin shale. This structure is cleverly made, the interior is curved in an arched manner, with no frame supporting the roof. The roof would not keep rain out, light shines through the roof stones. No hinges were on the entrance opening. With the forest debris removed from the entrance, it is now more easily accessible. While I could stick my head into the structure, I was unable to squeeze the rest of my body in. It would take a small person to comfortably get into it. The bottom of the ravine is heavy, sandy pebbley soil. There is a dry stream bed on the side of the ravine opposite the structure. There is abundant drift wood on the sides of the ravine, and evidence of heavy flooding is apparent. The roof of the structure has smoke stains, the walls do not. I found no evidence of pottery, broken glass, iron or other "stuff." I would not be surprised to be told that flooding carried away what ever debris someone left. The exposed cuts on the old grade exhibit the same type of loose soft shale as is found at Cape Horn. Occasional boulders no larger than a frying pan are found. The old grade in this area is easily found; the grade largely goes around the hills, with an occasional small cut. Could someone live in this structure? The smoke on the roof could lead one in that direction. Why a stone floor? I don't know. I would guess it would take a day to make this structure, certainly no longer than that. Between finding the tent frame in the Pequops a few weeks ago, this thing yesterday, it has been an interesting summer. New exhibit at the CPRR Museum: Sixteen Paintings by Howard Fogg (Commissioned for the 1969 Centennial Celebration of the Completion of the Transcontinental Railroad). Carol and I had the opportunity today to walk the old CPRR grade East of Colfax, California, and photographed a worker's hut that is about  feet from the old grade. This hut is 6 feet in diameter, and 4 1/2 feet from floor to ceiling. 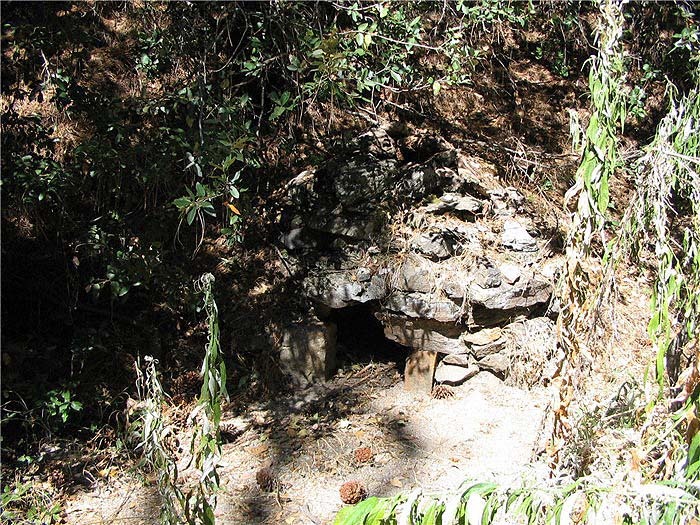 It is "dry laid," that is, no cement or material other than the stone that comprises the hut was used. 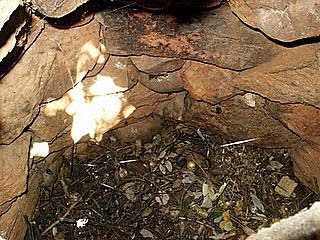 The rocks are well fitted together, but the roof is not water tight. (To photograph the inside from the roof, a stone was moved to accomodate the camera. 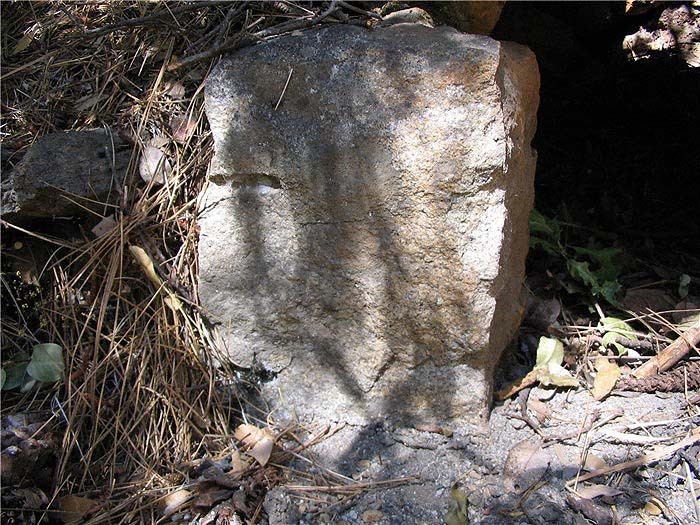 The stone was put back when the photo was taken.) 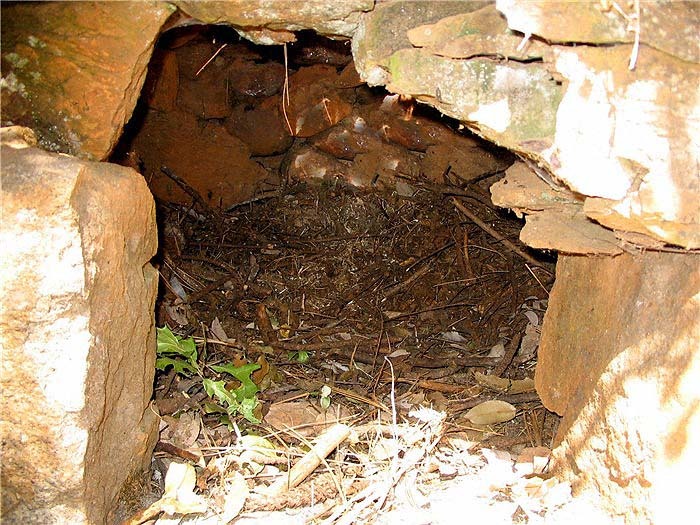 I noted no other signs of human habitation – no cans, bottles, dishes, etc. Whoever lived in this place was small – the entrance did not allow me to enter the hut. 5. Looking down at the top of the hut, from the old CPRR grade. This was difficult to find, unless a person had fallen down the hill, or was looking for this hut, it is nearly impossible to see from even a few feet away. 7. A closer look at the quarried stone in the entrance. I noted many piles of stone along the old CPRR grade in Nevada a few weeks ago, that would have roughly the same dimensions as this hut. 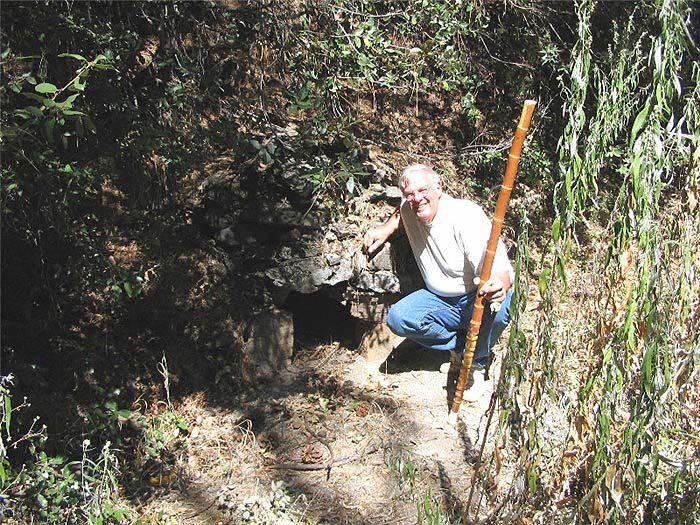 If this hut were collapsed, it would closely resemble the piles noted East of Moor, Nevada. I wonder how many more of these things are still standing in the Sierra?